Katana uses her years of training as a martial artist and juggler to add her own unique flare to the duo’s repertoire of classic sideshow and dazzling fire arts. 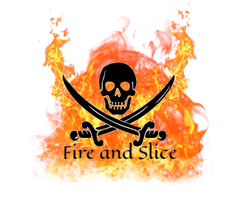 Whether she’s wielding a machete at Shaska’s bare flesh, walking in broken glass or keeping two blazing fire props moving at once, she does it all with grace and precision. Shashka cannot seem to get enough of pushing the boundaries. As a Human Pincushion she thrills and horrifies audiences with seemingly superhuman pain tolerance while her accuracy with a sledgehammer is nothing to sneer at. 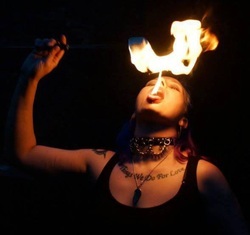 She also relies on her years of dance experience to make her fire-spinning one-of-a-kind, punctuating her act with dragon-like fire-breaths and fearless fire-eating.